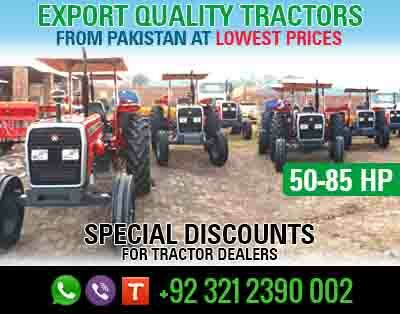 Tractors.pk is the leading worldwide exporter of agricultural machinery of export quality at competitive prices. We have a huge range of Massey Ferguson tractors which includes MF 240, MF 260, MF 360, MF 385 2WD and MF 385 4WD in 50 hp to 85 hp. Besides these top ranges of tractors, we also provide quality farming implements for helping farmers in easily and efficiently performing their farming tasks. So hurry up and get the export quality tractors in just 4 weeks time in Mombasa. We offer special discount packages for farmers with all shipping charges of the 20 ft and 40 ft containers at the Mombasa port. Alternatively, you may call or WhatsApp us to know more details about our tractor prices and shipment at the following number.